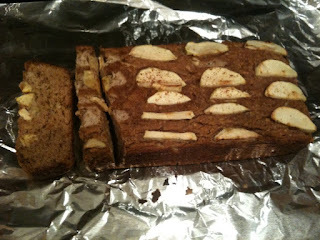 This apple bread reminds me a little bit of the delicious apple cake my step mom use to make. It must have been at least 20 years since I've had any. I was inspired to bake this for a few reasons. First reason is I had a whole bag of organic green apples in my refrigerator that needed to get used. Second a friend of mine was talking about his apple cake he threw together, which got me craving it. Third, my whole family has been wanting dessert so I wanted them to have a healthier option. This is the second batch I have made in just a few days. I will not make this for awhile since it's too good and gets eaten way to fast. Mix Almond Flour, Ground Pecans, Baking Soda, and Cinnamon together in a bowl. Then stir in Apple Sauce, Chopped Apples, maple syrup, and Eggs. Stir both mixtures together very well. Place in Extra Large Loaf Tin. 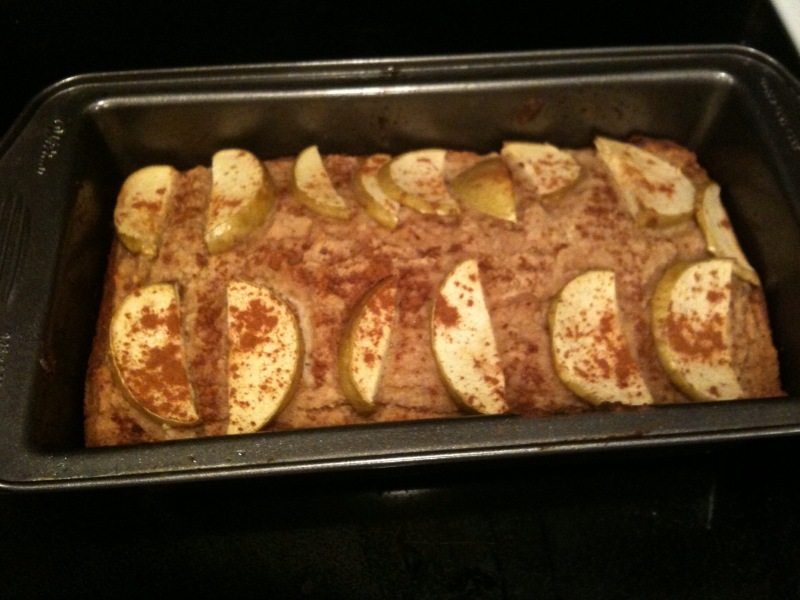 Place thin apple slices on the top and sprinkle cinnamon. Place in oven at 375. Bake 45-50 minutes. Check to see if ready with tooth pick since oven times vary. Thanks for this recipe- I'm planning on trying it soon! I was wondering where you get your recipes that are so health conscious? I've never made any "free" (gluten free, dairy free, etc) foods, but I'm thinking of trying some this year. Can you recommend any good cookbooks or websites? Thanks! 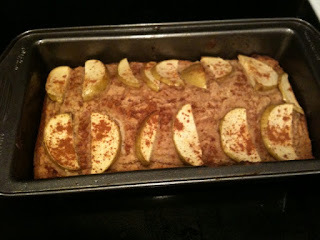 Am going to bake this soon as my son has a friend who has a gluten intolerance. Any idea if I can replace the pecans with another type of nut i.e. walnuts or hazelnut? Pecans aren't as popular in Australia. A great gluten free website that has awesome recipes is elanaspantry.com. Evelyn, You can use walnuts or even just use an extra half cup of Almond flour instead of the Pecans. Let me know how it goes.